Intriguing, romantic, and wholly original, Amy Spalding's sophomore novel is the perfect blend of humor and heart. Find out why Trish Doller called it full of "compassion, humor, love, and pitch-perfect authenticity." For Kellie Brooks, family has always been a tough word to define. Combine her hippie mom and tattooist stepdad, her adopted overachieving sister, her younger half brother, and her tough-love dad, and average Kellie's the one stuck in the middle, overlooked and impermanent. When Kellie's sister finally meets her birth mother and her best friend starts hanging with a cooler crowd, the feeling only grows stronger. But then she reconnects with Oliver, the sweet college guy she had a near hookup with last year. Oliver is intense and attractive, and she's sure he's totally out of her league. 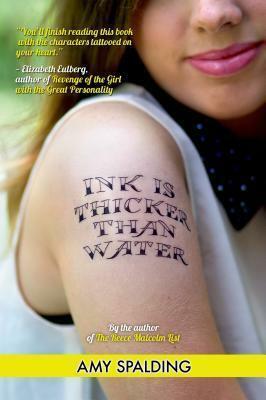 It'll take a new role on the school newspaper and a new job at her mom's tattoo shop for Kellie to realize that defining herself both outside and within her family is what can finally allow her to feel permanent, just like a tattoo. Amy Spalding is also the author of The Reece Malcolm List. She grew up outside of St. Louis and now lives in Los Angeles with two cats and a dog. She works in marketing and does a lot of improv.